I wanted a way to preserve the memory of the UFL much like the way I have done so for the WLAF so I created a set of cards for the league, since there was nothing on the market. It ended up exploding into a 100+ card set. 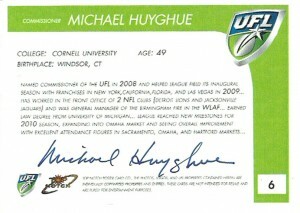 Michael Huyghue has been the much maligned commissioner since taking charge of the fledgling league, that was hoping to capitalize off of the NFL labor dispute in 2011. (Clicking on the back of his card will bring up a detailed profile.) Taking a beating from fans over the league’s nomadic franchises and their overly optimistic approach, the UFL has managed to survive into its 3rd season under his direction, albeit under a cloud of scrutiny and a shortened season. 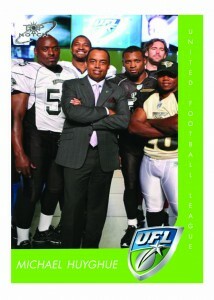 It is unknown what the UFL’s new long term strategy is, and that is part of the problem.The hope is after the 2011 season, the league can survive or reorganize as an NFL farm league- something that the NFL has needed for quite some time. American Football during the Spring has always been an elusive mystery as to why it can never succeed. Americans remain hungry for football year round, but when it comes to anything but the NFL, they squarely reject it as being an inferior product. 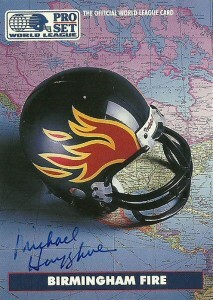 Michael signed these 2 cards through the league offices in a short 10 days for me before the season began in 2011. The web colors unfortunately did not translate on the Commissioner’s card properly and have been represented as a garish neon. The back is much more accurate. Utilizing this design in the future might require me to have a bolder font. Otherwise it was not a bad first stab.